CFS Factors to consider when creating your company’s brochure - CFS, Inc. Even though we are constantly hearing “Print is Dead”, many companies still use brochures to promote their business despite the popularity of digital marketing. Why? Although most people get their information from a company’s website, most customers still like to have something physical. Here are some factors to consider when creating your company’s brochure. How does it differentiate you from your competitors? If you put your brochure side by side with your competition, does it stand out? A well-designed brochure will help make a prospect become a customer. Does it fit into your brand’s current style? If a customer sees your business card and brochure side by side, will they easily know they are both yours? When designing your brochure use images, colors and fonts that similar to your other marketing materials and signage. Will they know what solutions you provide? Will a potential customer know exactly how you can help them? Keep it simple so it easily communicates what you do. Does it have a call to action? Call today! Visit us online! Subscribe today! Use a clear and decisive call to action so a potential customer knows what to do or where to go. 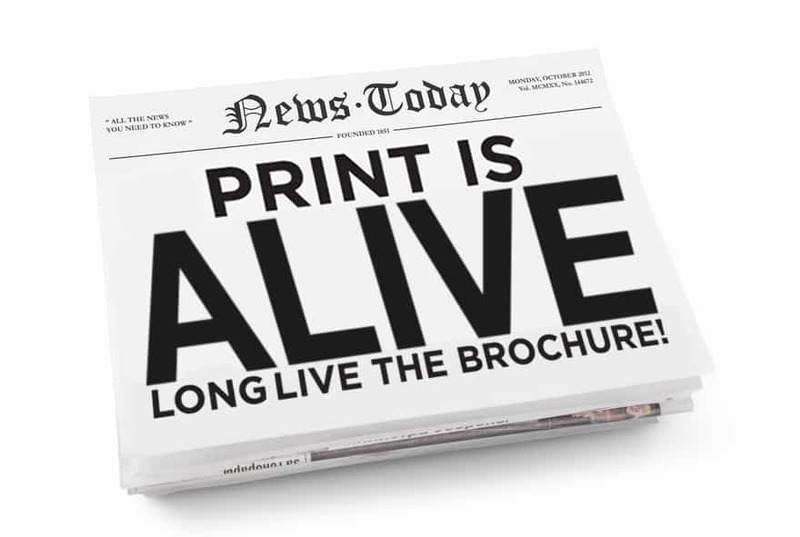 No matter what anyone tells you, Print is Alive! There is still a place for brochures and other printed collateral in the digital age. Given the versatility, it still remains one of the most important tools you can use in your marketing arsenal. Need help updating or creating a brochure? Contact us today, and we can help you get started. Cathleen Drury is the Marketing Coordinator at CFS, Inc. in Norton, MA. You can contact her at cathleen@cfsinc.com or click here to follow her on Twitter. If you would like to learn more about her, visit her Meet the Team page by clicking here.